No one comes out unscathed! 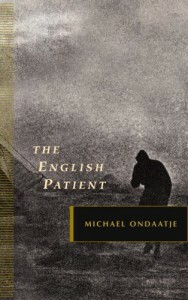 Michael Ondaatje’s novel, The English Patient, is rendered in a lyrical style that will transport you back and forth from a bombed villa in Tuscany, to the blinding sands of the North African desert, to war time England, and the vibrant era of pre-war Cairo. Told in the multiple points of views of a Canadian nurse, a Sikh sapper, an Italian thief, and faceless, burned Englishman, it breaks most traditional literary conventions, yet it is done with brilliant mastery. The horrors of war has made the characters reticent to reveal all the details of their past lives. Bits and pieces about themselves are presented cautiously. Sometimes the stories are coloured with the haze of wine or shots of morphine—to reveal too much is to make them vulnerable—not a safe position to be in times of war. This is certainly an important, historical book about the physical and emotional ravages of war, and proof that no one comes out of these horrific times unscathed.